From Early Greek Philosophy to Categories and De Interpretatione, from	Four Seasons Of Greek Philosophy to The Politics Of Aristotle, we can help you find the greek philosophy books you are looking for. As the world's largest independent marketplace for new, used and rare books, you always get the best in service and value when you buy from Biblio.com, and all of your purchases are backed by our return guarantee. Reprint. Originally published: London : Adam and Charles Black, 1892. Includes bibliographical references and index. 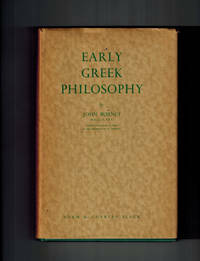 "Admirably fulfills its aim of explaining the development of Greek thought and Greek ways of thinking to the reader or student, who, while lacking knowledge of Greek, still wants to learn something about the philosophers whose ideas have coloured and influenced European culture"
New York: Limited Editions Club, 1947. Hardcover. Fine in a Near Fine slipcase with light wear. Octavo (5-1/2" x 9-1/4") bound in full black crushed goatskin morocco with a geometric blindstamped design. The Greek text printed in red and black with an English translation by Cyril Bailey. Decorated and designed by Bruce Rogers. Copy #932 of 1500 SIGNED by the designer on the colophon page. Cornell University Press, 1984. Paperback. Very Good. Disclaimer:A copy that has been read, but remains in excellent condition. Pages are intact and are not marred by notes or highlighting, but may contain a neat previous owner name. The spine remains undamaged. At ThriftBooks, our motto is: Read More, Spend Less.Dust jacket quality is not guaranteed. New York: Limited Editions Club, 1947. Hardcover. Owner blindstamp on the front blank. About Fine in a Fine slipcase. Octavo (5-1/2" x 9-1/4") bound in full black crushed goatskin morocco with a geometric blindstamped design. The Greek text printed in red and black with an English translation by Cyril Bailey. Decorated and designed by Bruce Rogers. Copy #845 of 1500 SIGNED by the designer on the colophon page.